April | 2009 | okay, peanut. Justin entered his guess on girlfriend’s arrival this morning, but before I reveal the details, a little background information is necessary. We’ve got this thing with numbers. Well, mine are more favorite numbers, and Justin’s number is just plain creepy. Mine are 7 and 13 – nothing special. Justin’s number is 39, and when I say this number follows him, it’s no joke. He can look at the time on the clock and it’s ##:39. Receipt totals end frighteningly often in $0.39. Car mileage at certain key intervals regularly ends in 39. I can’t even think of all of the instances, but it’s ridiculous. For those of you that know the story of our license plate, the combination doesn’t get any more perfect, or creepy, than that. So, there you have it, friends. Dad-to-be’s prediction on when his girl will arrive. We’ll see what happens! Until then, do you have any guesses of your own? I’m sticking with Justin’s prediction because it’s 3 days early! Justin and I switched cars yesterday; we’ve been having issues with the air conditioning in the Civic, so I brought it in to see if my dad could provide a fix before we have to send it to the dealership (Note: not so lucky on the a/c front. Oh well.). Notice the guys standing along the left side of the photo at the front of the silver car? Apparently one of them had a fire extinguisher in his hand that could have at least helped prevent the rapid growth of the flames, but instead he thought the fire extinguisher was more helpful unused and by his side. Nice. The car, along with the bushes, continued to burn until the fire department arrived several minutes later. It seems the driver of the flaming car spent 20 minutes or so in his/her vehicle on a phone call, turned off the car and exited. The thought is that the hot exhaust on a 90+ degree day ignited the bushes, and then the bushes ignited the back of the car. 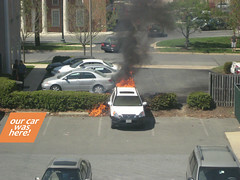 Luckily, the driver was inside the building, not the car, before the fire started, so s/he escaped any injuries. Yep, that’s right – no update from today’s appointment. I guess no news is good news, but don’t they tell pregnant women their progress anymore? I guess it doesn’t matter; as of today, I’m 37w2d, so it’s fair game for her to arrive when she feels like it now (I wish … but she’ll take her sweet ol’ time!). Really, what good does knowing details do? Oh, the many joys of pregnancy! As of today, we’re 19-ish days from becoming parents. At this point, I just can’t wait! I want to meet her, hold her and love her. Justin and I often try to imagine what she’ll look like – what traits she’ll inherit from either of us, which characteristics she’ll pick up from other family members, and what will make her unique. We’re 19-ish days from finding out! We were sitting on the front porch swing yesterday afternoon, and completely out of the blue Justin said, “I think she’ll like spending time out here.” My heart melted at the thought of him planning for her. I think he’s right. Even better, I know where to find the two of them if they go missing throughout the summer! I find myself thinking about how every little aspect of our lives will change – from trips to the grocery store to a dinner out. I know things will be different, and in my mind, the difference is in no way a bad thing. In many ways, the spur of the moment things we used to do will become more complicated, and that’s okay. All in all, life will be much more fun, and so much more meaningful. Yep, I’m excited. Excited, and SO ready to meet our new girlfriend! On the update front, the nursery is almost done. It’s been getting closer and closer, and we’re almost there. I’ll promise to post pictures sometime this week as I know many people have been asking for updates! I spent yesterday afternoon washing the rest of her sheets and clothes, getting sheets and accessories on the crib, and filling up containers. Just details to go, then all we need is her to make it complete! If anything exciting comes of this afternoon’s appointment, I’ll update, as well. We’ll see! Little miss has dropped some, and I know it really means nothing, but it’s progress in my mind! the most amazing feeling in the world of this little person moving around in my belly. I will miss this, for sure. Fiona feet (If I spray painted these suckers green, I could be Princess Fiona’s double! Hello Hollywood and Shrek!). waiting to make special moments for our family members! Lots of firsts ahead as three fantastic sisters will become first time aunts, one brother will become an uncle, two awesome nephews will get a cousin, a set of parents will become grandparents for the first time, and another set of parents will become grandparents of 3, now to include a granddaughter! needing help with my shoes. Then again, I haven’t seen real shoes in a few days, so this may not be valid. Yes, I can get my Crocs, flip flops and slippers on all by myself! Yay! being without some sort of “beverage!” I really only had a beer, glass of wine or cocktail on rare occasions anyway, but 40 weeks is pushing it, people! waiting to meet the person we’ve created. Oh, how I can’t wait to meet her! Cody’s kingdom. Our husky will learn quickly that he is NOT #2 in line behind daddy (Believe it – he really thinks he ranks higher than me in our hierarchy. ), but rather #4. I can only imagine what destruction we’ll face until he really gets it. looking into an empty crib … just waiting. rolling over in bed like a walrus. This is a trade, however, to be replaced by waking for feedings. worrying about my belly popping out of my ever shortening shirts. What seems so long at 20 weeks just isn’t quite long enough at 37 weeks! Thank goodness this has yet to happen. dreaming about holding her in my arms. my husband being a father-to-be. Can’t wait until we drop the “-to-be” and become dad and mom! quiet. Sweet peace and quiet. her protection. It’s a crazy world out here and while we can take steps to help her be as safe as possible, anything can happen. suspense when it comes to the name game! Who will she be? We’ll have to wait and see! not being able to reach things. wondering how life will change. I’m so ready! the obnoxious parts of pregnancy, like people asking, “How are you feeling?” instead of, “How are you?” (Ha ha, I have to clarify here! It’s the people who ask this on a daily basis that drive me crazy. I want to say, “I haven’t changed in the past 24 hours or less, you know, since the LAST time you asked me! And by the way, how are YOU feeling today?”) Like people looking at me like I have 8 heads or laughing when they see me. What’s so funny? Like strangers touching my belly like it’s their property and people talking to my protrusion with their face just about in my … eh, I’ll spare you the details. uncomfortable car rides. An hour is about all I can handle these days, and we’ve had too many long trips in the past few weeks. It’s not easy! a dishwasher-less kitchen. Well, it’s there, it’s just not hooked up yet – I guess technically we’re not dishwasher-less. We’ve survived, but I’m ready to appreciate this lovely appliance already! waiting for at least part of a summer off! Once little miss arrives, I’ve got at least through June until I return to work, and could stretch it until early August if I really want to! I could go on and on … but I’ll stop at 23. These 23-ish days will be both too long and too short, and girlfriend’s arrival will be here before we know it. I can’t wait to meet our little miracle! Seriously!? We’d had flurries off and on all day yesterday, and some of them were fairly intense as I headed further north towards home and at home throughout the evening. 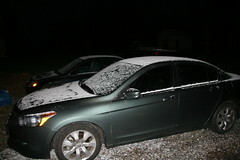 I did not at all expect to walk out the back door this morning at 6 am to find my car covered in a layer of snow! Even more exciting was the fact that we needed the scraper to remove the layer of ice that had formed on the windshield! This is so not what spring is all about … 34 degrees at 6 am is okay for February, but it’s April 8th!! !